Whether you are working, visiting, or living in the area, when you need Bellmawr auto glass replacement, Clear Vision Auto Glass is here for you. Our trained mobile auto glass technicians are ready 24/7 to come out and service your vehicle. Or schedule an appointment with us any day of the week, and we’ll get you on the road safely again in just a few hours at a fair price. Repairing Cracked Windshields. When you have a small chip or crack in your windshield, if it is smaller than a quarter it can usually be repaired. Don’t wait to have it done…a crack will likely grow larger and require a much more expensive windshield replacement. Call Clear Vision and one of our techs will come out and repair it for you in often less than 30 minutes. Replacing Broken Windshields. If you need an entirely new windshield, our mobile techs can fully install one for you. 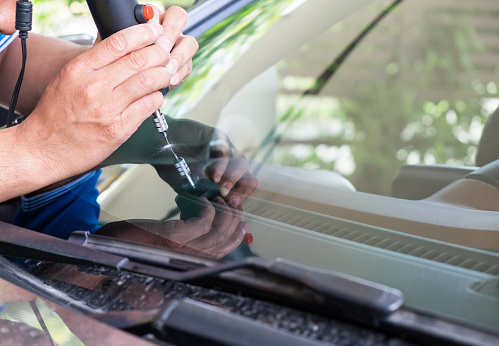 We can replace your windshield with original equipment equivalent glass, or less expensive and equally functional aftermarket equivalent glass. Replacing/Repairing Mirrors. Did you know that over 250,000 accidents happen on our highways each year because of blind spots? Driving with a cracked side or rear view mirror is a huge risk. Call on us to replace your broken mirror, including repairing power wire connections. Repairing Power Windows. Don’t pay the increased cost of taking your car to a dealership for power window repairs. Clear Vision can fully assess the damage, bring out the needed parts and completely repair your power window, including disassembly and re-assembly and vacuuming any shattered glass from your car. Whatever your Bellmawr auto glass replacement needs, call Clear Vision anytime…or use this online form to request an estimate. We’re ready to repair your vehicle and help you see the road clearly again.